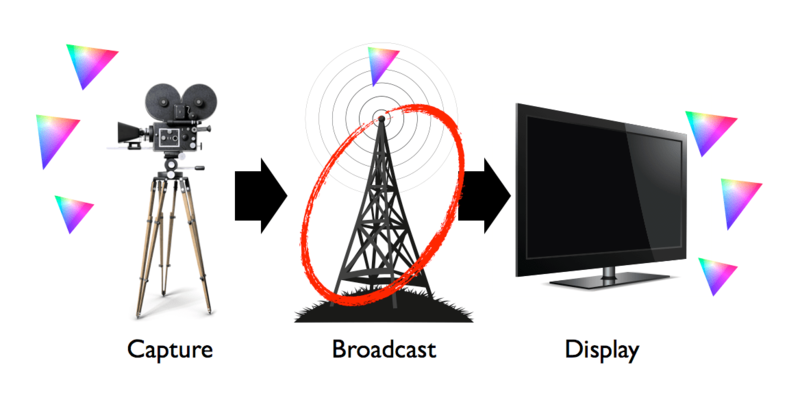 In the previous post in this series, I made the case for displays with hybrid, custom color gamuts as a great way to deliver coverage of Pointer’s gamut as well as the most important broadcast standards. We can build the hardware today to support these large color gamuts so its seems like a great solution but there is a catch: nobody is broadcasting or distributing these large color gamuts today. So, are we going to have to wait for broadcasters and content creators to slowly catchup, much like we did with HDTV? Content is captured and viewed in a wide variety of gamuts across a range of different devices but only broadcast in one gamut. Today, content creators are actually shooting in a wide variety of color spaces ranging from RAW to rec.709 to Adobe 1998. They are then forced to cram all of these different sources into the lowest common denominator rec.709 standard for broadcast or distribution. That same content is then displayed on devices with a range of different gamut capabilities from tablets that only cover about 70% of rec.709 to HDTVs that do meet the spec to OLED devices that oversaturate the content. There’s a lot of diversity on both the capture and display sides and a clear bottleneck in the middle in the form of broadcast and distribution channels. Adhering to broadcast standards is no longer sufficient to guarantee a good experience for consumers because there’s already too much diversity on the display side alone to rely on one standard. You just can’t be sure that consumers are actually looking at your content on a rec.709-capable device. We’re also losing a lot of the value that creators are capturing and could, in many cases, be delivered to end viewers who have the devices to show it. How do we get around broadcast standards? The first thing to note is that the internet is democratizing broadcast and distribution channels. With the web we can deliver whatever we want, whenever we want. Some players in the industry, notably Sony, are already doing this with 4K content. If there’s no content available and you believe in 4K resolution, you just deliver your own content directly to your customers. 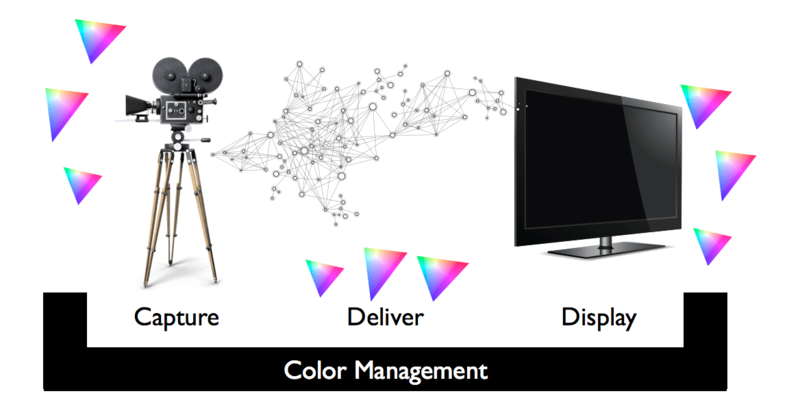 Wide color gamut displays combined with good color management and the web as a broadcast platform will allow content to accurately be displayed in the original color gamut. Still, this leaves us with some potential experience problems. If the right display gamut is not matched to the right content the results will be no different and that’s why color management is key. There are several companies working on color management solutions and certification programs for devices that will make it possible for wide color gamut displays to handle a variety of incoming gamuts. Using metadata, for example, a wide color gamut display can be alerted to the presence of Adobe RGB content and then remap that content on the fly to assure that it is displayed accurately on that specific panel. With great color management, we can maximize the gamut on the display side and pull through the best possible gamut for the device we are looking at. In this way, we can deliver always accurate content that meets the designers intent, wether artistic or commercial.